Update: The response to Tertill’s crowdfunding campaign has amazed and delighted us! Pledges totalling over $250,000 have come from 1000+ backers. We’re shipping to all countries, with over a fifth of Tertill’s supporters coming from outside the United States. But the end is near; Tuesday (11 July) is the last full day of the campaign. After that Tertill’s discounted campaign price will no longer be available and delivery in time for next year’s (northern hemisphere) growing season cannot be assured. 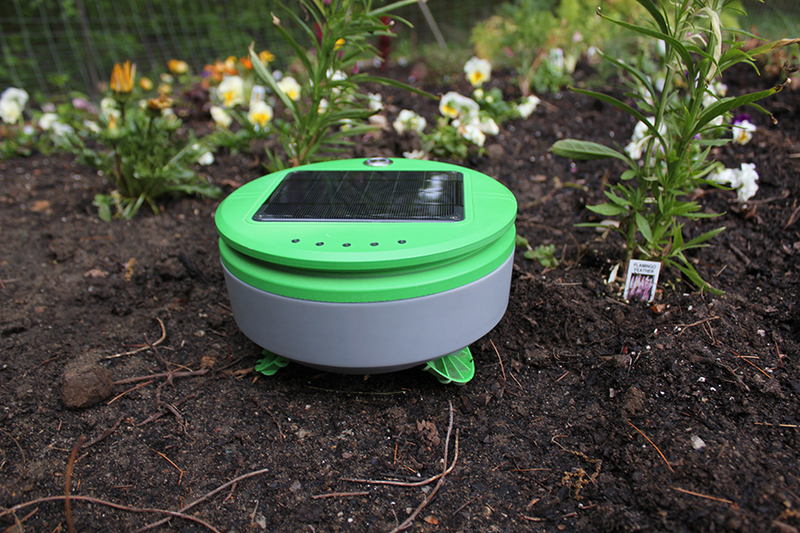 Franklin Robotics has launched a Kickstarter campaign for Tertill, their solar-powered, garden-weeding robot. Tertill lives in your garden, collecting sunlight to power its weed patrol, and cutting down short plants with a string trimmer/weed whacker with almost no intervention required. 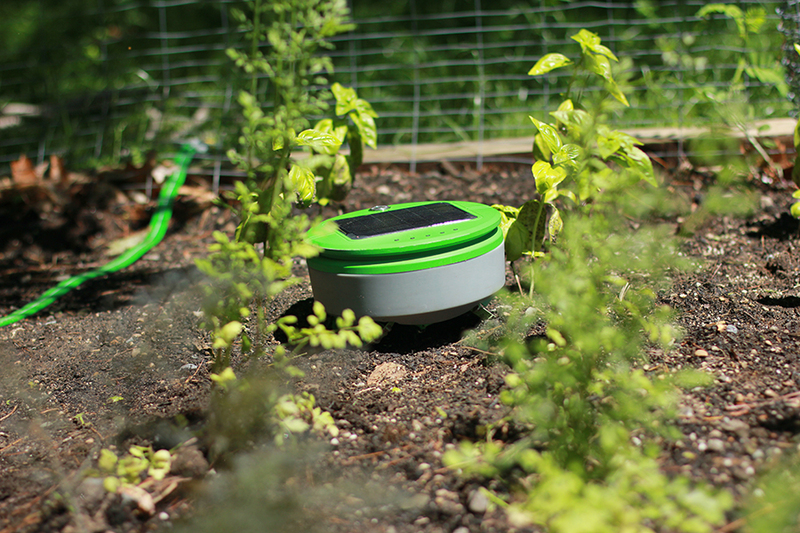 Available for about $300USD, the fully autonomous Tertill is the first weeding robot available to home gardeners. Tertill is round, short, has four wheel drive and extreme camber wheels. It uses proprietary algorithms to ensure that it finds as many weeds as it can, using its sensors to distinguish between weeds and crops based on height. As Tertill sees it: small plants are weeds, big plants are crops. But what if you have seedlings? Simply place a plant collar around seedlings to inform Tertill that this plant is wanted. Tertill doesn’t use a camera for weed discrimination because Franklin wants to put Tertill to work in your garden now. In the not-too-distant future, inexpensive vision systems may reliably distinguish between plants and crops even when both are seedlings. But, according to Franklin, such system are not yet ready. Tertill is designed such that one robot can easily keep up with the weeds in a typical sized garden (that’s about 100 square feet in the USA). Tertill will usually handle gardens considerably larger than this, but how much larger depends on weather and local weed types. And Terrill’s can work in teams, coexisting harmoniously in the same space. Multiple Tertill robots will simply avoid each other. But Tertill needs a small barrier to keep it from wandering off beyond the borders of your garden. A garden fence, the wooden border of a raised bed, or any sort of edging that is two or more inches tall will work. Otherwise, Tertill is designed to live in your garden and require very little attention. Summer showers won’t bother it. And, under normal conditions, you won’t have to worry about charging Tertill—the sun will see to that. But, if Tertill has been in the dark for so long (months) that its battery is completely exhausted, a USB connection can be used to charge the battery. Franklin believes that small, simple robots can help solve big, complex problems. Franklin’s robots aim to help gardeners by reducing the tedium and physical challenge of weeding, making gardening more fun. The data their robots collect helps gardeners garden better, improving yield and quality. Their robots aim to benefit the environment by eliminating the need for herbicides and returning organic matter to the soil. Click here to visit Franklin’s website and learn more.